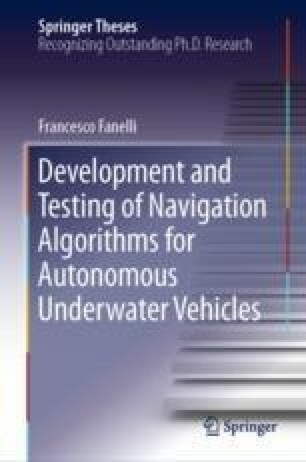 This chapter is dedicated to the AUV navigation filter developed during the Ph.D. period. Such filter is able to estimate the complete pose of an UUV fusing the measurements of onboard sensors in real-time. In particular, a parallel structure has been chosen (Fig. 4.1): attitude is estimated independently using IMU, compass, and FOG data, and constitutes an input for the position estimation filter.